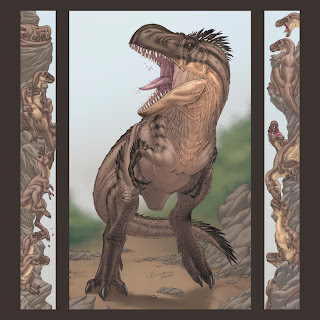 Carnosauria: Tyrannosaurs part the Third: T. rex! This is a quicky of a female, we call her the Chocolateosaurus here, I was going for a more drab look on her compared to the male in the next picture. This is the most current picture of T.rex that I have done. I'm actually not a big fan of the animal. Maybe it's over exposure? This one (and the next one) was colored by Jess, and the tails are WAAYY to long. But I do like the juvenile rex and triceratops. I drew this one awhile ago so go easy on me. This was the very first picture of Tyrannosaurus rex I did. The little ones on the side were added for a book, I can't remember what it was called or if it was even used. Depending on who you talk to there are 1 to 3 species in this group. 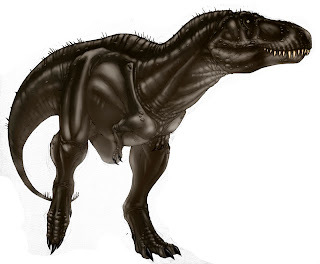 Tyrannosaurus rex, possibly Tyrannosaurus (Tarbosaurus) bataar and Tyrannosaurus (Nanotyrannus) lancensis. It will be interesting to see if they ever come to some sort of conclusion on this but since they only have bones it doesn't seem likely. The face on that male looks fantastic. Great work ! The T-rex is mine favourite dinosaurs, and i love yuor second T-rex of this page ! Hello Mr. Brett! I imagined how the real T. Rex looked like. According to new ideas we (me and Martin Kocsis) created a theory, and Martin drew an illustration. T. Rex's first relative was the Guanlong. Guanlong was a dinosaur with crest on its head. It was a bone crest. Later it disappeared, but maybe not this whole formation. We think that the skin is still remaining, like today, at the modern ......chickens (Among the animals living today, the chicken DNA is the most similar to the T. Rex). So T. Rex might had a crest on its head, but it was made of skin, and not of bone (like at guanlong). You can see the illustration, T. Rex has feathers to be more bird-like. Thats our theory. Thank you for listening and sorry for our bad english.Attila Kovács from Hungary.I wonder why others didn't reach this theory, that T. Rex has crest on his head. That would not be a correct theory. Guanlong, is far to old to be a direct T.rex ancestor. It is possible that Tyrannosaurs go back to Guanlong, but it's also more likely that Guanlong was a dead end. It's alos more likely that Guanlong would be closer related to Dryptosaurus. There is a pretty obvious line from Gorgosaurus to T. rex. I believe that DNA was actually residue from a turkey sandwich and it was supposedly from a Triceratops! No real T. rex DNA that I am aware of has been found. Sorry to be so nit picky. I try to stay on top of the current science, but your enthusiasm is great! The second picture is COOOOOOOOOOLLLLLLLLLLLL!!!! It's a male? Because its feathered. And on 3th picture which t-rex is the male? the brown or the big grey? On Dinosaur Revolution the male t-rex is bigger than female.Its a new find?